I was reading on forums / comments that a lot of people miss RadioTray in Ubuntu 11.04. You can enable the Systray and get RadioTray to work, but if it's just about RadioTray, you don't need to enable the Systray because RadioTray comes with an AppIndicator (it's not enabled by default). 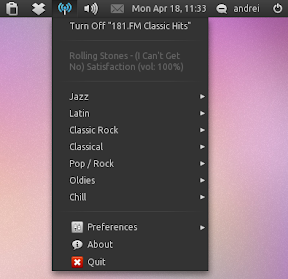 So here's how to enable the RadioTray AppIndicator (this works for both Ubuntu 10.10 and 11.04). Update: you can skip the manual steps below by using a PPA that comes with a patched RadioTray that enables the AppIndicator by default (thanks to eugenesan for the patched RadioTray PPA!). Please note that the PPA comes with quite a few packages and it will update other applications too so use it at your own risk! 1. Download the latest RadioTray (0.6.3) from HERE and install it. 2. Important: run RadioTray - you must run RadioTray at least once so it creates the config files. 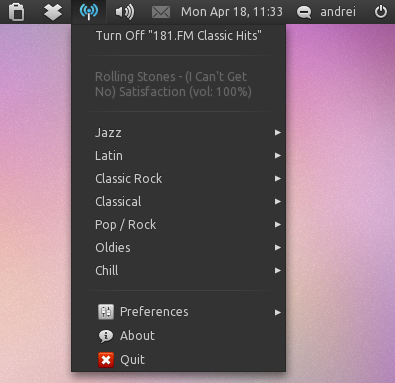 Then close RadioTray (since you can't close it without a notification area in Ubuntu 11.04, simply open a terminal and type: "killall radiotray"). 3. Now, to enable the AppIndicator for RadioTray, open ~/.local/share/radiotray/config.xml and modify the "<option name="enable_application_indicator_support" value="false">" value from "false" to "true", save the file and start RadioTray.